Cruising the NAB Show floor this year, the CAME-TV Accordion Jib with it's odd looking design got a fair share of attention. Having sold some of these units, CAME-TV has asked me to walk through my setup process with this system in hopes that it could help some of the other Accordion users out there. It's also a good reference video for those curious about this system. So this video walks you through my assembly of the CAME-TV Accordion Jib which is actually quite simple. The process to set it up is much faster than the length of this video (as I was trying to narrate the bits and pieces). - Note: There are no sample videos from this jib. That would be in the next video. At first attempt, the Accordion Jib might seem a bit overwhelming with the crazy design, but there are only a few Major parts to this system with about a dozen clamp knobs or so. The tripod is made up of 3 pieces + Caster wheels, the Jib needs the motor and Front Head attached, and finally the Rear bar for the counterweights and joystick. It's certainly not a system that would replace your lightweight carbon fiber travel jib, but could be a clever system for anyone looking to purchase a 15 foot jib. One thing is for sure, it's definitely a head-turner and conversation starter. 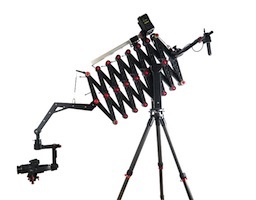 There are additional Photos, Videos, and more information about the CAME-TV Accordion Jib at the product page (HERE). Posted in dslr video. Tags: came-tv accordion, came-tv jib, cametv crane, gimbal crane, motorized jib, Motorized Pan Tilt Head, motorized video crane, video jib on July 6, 2016 by Cheesycam. Very innovative product! Finally a Jib that gives push pull capability of the Techno crane which can only be deployed by big budgeted productions. Does the Ronin M gimble fit on this? this type of jib has been used on larger film sets. it's nice to see it coming to a more affordable price point. @Kay O. Sweaver - Yeah makes sense. 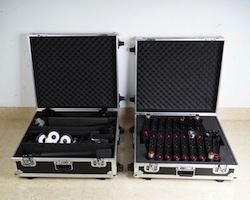 It would be able to push in or pull out where other lenses would see slider or dolly tracks. That is a pretty awesome piece of kit. Can't wait to see samples. I could see this used for some great push in/out shots where a dolly wouldn't work or would be in the shot.